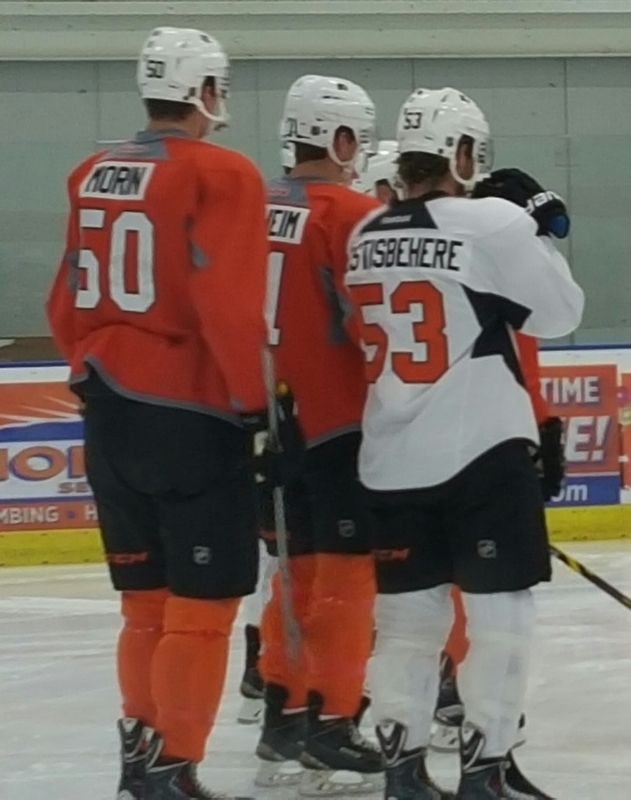 Samuel Morin (left, #50) towers over his fellow teammates at the Flyers Development Camp in Voorhees, New Jersey. The 6-foot-7 defenseman turns pro this fall. The Philadelphia Flyers have stockpiled highly-touted defense prospects in recent years and none stand taller than Samuel Morin at 6-7, 228 pounds. The 20-year-old defenseman has evolved quite a bit over the past few seasons, developing into a stalwart defensive defenseman in the Quebec Major Junior Hockey League (QMJHL). “I know people see me like just a defensive defenseman, but I know I can bring some offense sometimes,” Morin explained. The next step is turning pro and landing a spot with the Flyers on the NHL roster– a challenge that Morin looks to meet head later this month when training camp opens in mid-September. He entered his third Flyers development camp earlier this summer in peak physical condition, adding muscle mass to his lanky frame while also noting he lowered his body fat to an impressive 8.8%. Morin is as excited as any about turning the page to the start of his pro hockey career. He also knows that with so many talented young defensemen alongside him, the hard work doesn’t stop here. While joining the Lehigh Valley Phantoms in the American Hockey League (AHL) seems to be the most likely destination for Morin to begin his pro hockey tenure, it will nonetheless give him a feel for what the pro ranks have to offer. The towering defenseman is looking forward to competing against men after having, for the most part, skated against teenagers the past three seasons in the QMJHL.